For months, I had in my head how our birth story would happen. We’d wake up in the middle of the night and gather our things, hug the dogs goodbye, and calmly head to the hospital to become a family of three. We planned hard. We took classes. We read books. We hired a doula and practiced breathing, positions, and laboring at home. I figured I’d have your standard 15 hour, first-time mom labor. I thought Landon would have time to leave at least once to come home and check on the dogs (he didn’t leave my side at all. The man is a saint!). We even talked about coming home after one night if things were going well! And yet, that’s not how it went at all. Tuesday night at 10 pm, my doctor made the call to have me come into the hospital due to swollen feet and slightly high blood pressure readings at home. I’d called her because my feet were more swollen than I’d ever seen before but I felt fine. We packed our bags just in case and drove the 15 minutes to the hospital. There weren’t any triage rooms available when we arrived so we waited in the lobby until 11:30ish when we finally got a room. They hooked me up to monitors to check out my blood pressure, contractions and baby’s heart rate. All looked great upon getting set up. They wanted to monitor us for a couple hours and do some blood work just to make sure I wasn’t swollen due to preeclampsia (spoiler alert, I wasn’t). Somewhere around 1:30 AM, they came in to let me know that my blood work was fine but, while they’d been waiting on that to come back, the baby’s heart rate had dipped once and my blood pressure had gone up at the exact same time, so they wanted to admit us and go ahead and induce me. I waited until the doctors left and then I cried. I didn’t want to be induced. I didn’t want my baby’s heart rate to be dipping. I didn’t want any of this to be happening. Landon reminded me that we only cared that our baby was healthy and that I was safe, too and we’d do what we had to in order to reach that point. He hugged me while I got myself together and we prepared to begin our hospital stay where we’d meet our son. I wasn’t dilated at all when they checked. In fact, they said my cervix was “closed like a safe.” They ordered a Foley catheter which is a balloon filled with water that goes in the cervix to help initiate dilation (up to 3 cm). That was placed at 2:30 am and we were officially admitted at 3:45 AM. We did our best to sleep between nurses coming in and out and the beeping of machines. They gave me Ambien to help with sleeping (I only took half a pill each time – which confused the nurses – but part of my birth plan was no drugs that would reach the baby) and they prepared us early on that it might be a while before we actually had a baby in our arms. On Wednesday, we napped and walked the halls of the labor and delivery floor. The foley bulb was uncomfortable but I certainly didn’t want to lay in bed all day. They checked throughout the day to see how dilated I was but things were moving very slow. They could leave the foley bulb in for 24 hours and that’s what they intended to do… so we napped some more, ate lunch and dinner, watched basketball and did our best to relax. We kept our families updated on the progress but the information was limited since everything seemed to be going so slowly. The good news was that my blood pressure readings were all normal, the baby’s heart rate was steady and my swelling had gone down. They removed the foley bulb at 2 AM and placed cytotec by my cervix to help it continue to soften/dilate. We got some sleep after that but my doctor told me to go ahead and order breakfast at 6 AM because they were going to start me on (the dreaded) Pitocin. There would be no more food until after my delivery. I ate the biggest breakfast sandwich ever and we walked a bit more knowing that soon I’d be hooked up to machines and not be mobile any longer. As I was getting back in bed, my water broke. This seemed like a victory to the nurses. It just made me uncomfortable as I started really feeling my contractions. Since they were already set up to start the Pitocin, they moved forward with it about 15 minutes after my water broke. If you’ve had Pitocin before, you know that it intensifies the contractions and makes them occur closer together. They started it at level 2 and told me it goes up to 30 and they’d increase it every 30 minutes or so. I hated it from the start. I almost immediately asked for nitrous to be brought into my room to help me get through the contractions. Thankfully the anesthesiologist was quick and had it set up in a matter of minutes. Half of my plan went out the window the second we were admitted, and more items were marked off as we moved through the hours. I kept joking with my doctor that every time I saw her she was crossing something else off. We’d hired a doula but we weren’t sure when to have her come since things were going so differently than we’d planned. We didn’t know what she’d do and we felt bad having someone just sit in the room with us. Landon helped me breathe through the contractions until they dialed it up to a 6. At that point, the nitrous wasn’t cutting it. I started asking for an epidural. Landon encouraged me to breathe and I resisted the urge to punch him. The nurse dialed the Pitocin back because she could see my contractions were pretty intense and frequent and then went ahead and called for anesthesiology. I was terrified of having a contraction while they placed the epidural. The worst part was the position they make you get in to have the epidural – the needle itself wasn’t too bad. Within minutes I felt relief. My doctors encouraged me to try to get some sleep if I could and told us again that it still might be a while before we had a baby. I took a good nap and when they came back in to check me, I was 7 cm dilated. We felt like things were moving along enough then that we could call our doula. I had been so hot up until this point (the AC was on 55) and poor Landon was bundled up in a sweatshirt and blankets when he was trying to nap. Our doula and birth photographer both arrived at 3:30 PM and I threw up as I tried to say hello. I’d heard about people throwing up during labor, but had hoped I wouldn’t be one of them. I asked for anesthesiology to come back into the room because I didn’t feel like my left side was numb at all. Again, they were super prompt getting into my room and as she began to test my numbness with a piece of ice, I began throwing up again. They had me roll to my left side and pump the button for more medicine every 20 minutes for an hour to see if that helped. I started to cool off while laying like that and asked that the heat be turned up and for an extra blanket. The nurses went into overdrive at that point and realized that I had a fever. It seemed like I had been fine just a moment before but all of a sudden I was shaking violently (so bad that nurses were holding me down), couldn’t get enough blankets on me and was still cold even with the heat on 80 (side note: the nurses had to hate me for these drastic temperatures!). Landon later told me that the way I was shaking reminded him of when he went into septic shock as a kid due to a ruptured appendix. I had no idea it was that bad but I attribute that to the calmness and quickness of the nurses. Now that I had a fever, I had to be on antibiotics and even more fluids (welcome back, swelling!). And I was starving but only allowed clear liquids. My doula got me orange popsicles which were the most delicious popsicles EVER (I was 12 hours without food at this point). Everyone left in shifts to go get food and to not eat in front of me… but I made them all tell me what they had to eat so I could live vicariously through their dinners. I also stared at the menu and planned out my next meal for when I could finally eat. Around 9 PM, we started realizing that it might be another day before our baby actually arrived. My doctor decided to check me again and at that point I was 9 cm dilated, so we were finally getting close! She said she’d be back in two hours to check again and told me to try to grab one more nap before the fun began. Just before midnight, the doctors came in with our fabulous nurse, Katie and confirmed that I was fully dilated and effaced. They asked me if I wanted to try some “practice pushes.” I asked a little later on “when we start pushing for real…” and they all laughed and said we were definitely already pushing for real. 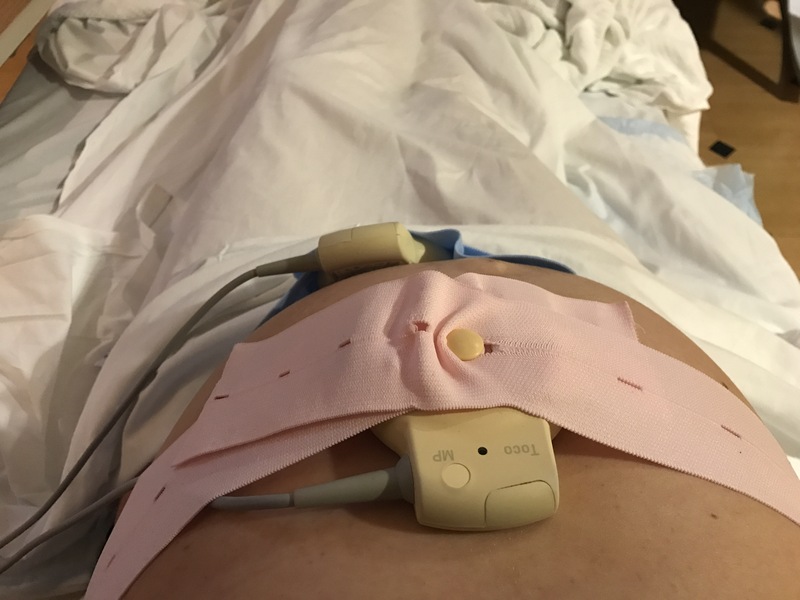 I could still feel everything on my left side but didn’t want to take any narcotics and since we were pushing now, the chances of the epidural being re-done seemed slim. Landon put on our playlist and we had our diffuser going (we got lots of compliments on both of these things). He held my hand on one side and my doula was on the other side. Nurse Katie ran the show. We were so impressed with her! After two hours of pushing, I became very exhausted, reminded everyone how hungry I was and started crying because the stupid epidural wasn’t working at all. I could feel everything on both sides now. Previously, they’d sent in anesthesiologist residents to place the epidural and check on it, but this time the attending doctor came. He poked me with a pin on my low back and legs and I confirmed that I felt each and every poke. He was surprised but decided to adjust the epidural and they increased the dose. It still NEVER worked on my left side. The 20 minute break was all I needed. I was able to compose myself, Liam moved down in that time, and I felt like I had a little more strength to continue on. Every few pushes, I changed positions (and threw up again)… this went on for another two hours. I asked Dr. Feller how many more pushes and she told me three should do it. Nurse Katie called in the NICU doctors (precaution) and another nurse. And then, I had a wave of calm wash over me. I asked the photographer to move to the other side because I wanted pictures of Landon’s face when he saw Liam for the first time. This makes me laugh now, that even in one of the hardest moments of my life, I was concerned about getting the good picture. Landon said I just became very focused and quiet and then we saw him for the first time at 3:55 AM. We were both crying and waiting on him to cry. The nurses were rubbing him while placing him on my chest and I remember one of them saying “come on buddy, where’s that cry?” And just before I could panic, he let out a cry and the whole room had a mood change. Landon got to cut the cord while I did skin-to-skin and marveled over how perfect he was. I kept asking Landon to count his fingers and toes and we immediately commented on how he has my mouth. The NICU doctors weren’t needed (thankfully), we were able to donate the cord blood, and we had a healthy baby boy. Due to my infection in the placenta, we weren’t able to do the encapsulation as we had planned but we’d learned long ago (3 days to be exact) that we needed to be extra flexible with our birth plan. The most important item on our birth plan was healthy baby and we got just that. I could not be more grateful for Dana Ashley Photography for capturing these priceless memories for us. If you ever want to fall in love with your husband again, just have a baby with him. I can promise you your heart will feel like it is going to explode with all the love you have in there! Our doula Heather was great with talking us through those last 12 hours of labor, making sure we had whatever we needed and supporting us both. The nurses and doctors were fantastic and I can’t tell you how much I feel like them staying calm at certain moments saved us from tons of worry. And the food at the NC Women’s Hospital is delicious. Like I’ve joked about just going there for a lunch date…. While our experience was nothing like we’d thought it would be or planned, it is ours and we walked away with a beautiful, healthy baby boy. And now we’re almost 3 weeks in as a family of three and we’re all still breathing, we’ve gotten sleep and we’ve even been out on a date already! This is just so, so beautiful. Reading it was like reading Claire’s birth story and brought me to tears. I can still feel the emotions of how all my well laid plans for a natural birth went out the window with her due to my induction that I didn’t want. I’m so glad you can see the blessing of a healthy mama and baby. I hope in due time you are able to re-write your giving birth story with another angel. Cheers to 20 days — it only gets better! It was worth it all, wasn’t it.